This installation became a subpost of Fort Douglas, Salt Lake City, on July 29, 1941 and additional land acquisitions brought the total area to 1,822,000 acres. The total site was 18 to 36 miles wide and 86 miles long. The site was hailed as the largest bombing and gunnery range in the world. 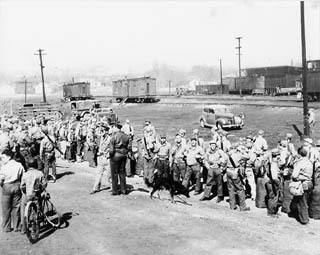 The first unit to be assigned, moved to the desert post on August 12, 1941 with a detachment of one officer and ten enlisted men. Another 37 men moved there soon after and started setting up targets on the salt desert. Construction continued from 1940 through the end of the war, but the most intense building period was completed in 1943. Projects included an enhancement to the water supply, directing this precious resource from the Johnson Springs complex. Wendover Army Air Base was activated on 28 March 1942 as a B-17 and B-24 heavy bombardment training base, and the first unit, the 306th bombardment Group of four squadrons of B-17 aircraft arrived in Mid April, 1942. 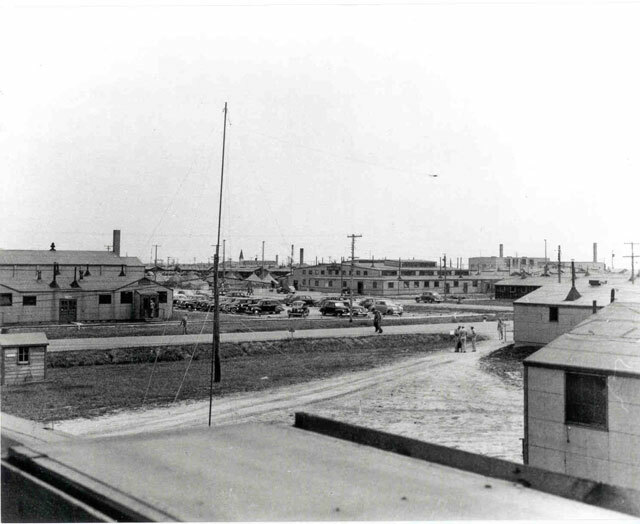 Few buildings were completed and training facilities were scarce when the 306th Bombardment Group arrived. 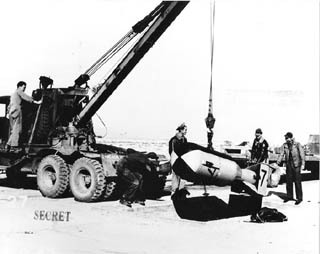 A city of salt and other targets were built on the Bonneville Salt Flats by the range detachment. They also installed an electrical system for night illumination and built a machine gun range north of town. By the end of 1942, three groups had completed training, and a fourth group was still in training. Training included exercises in high-altitude formation flying, long-range navigation, target identification, and simulated combat missions. During 1943, thirteen additional bombardment groups were trained at the Utah range. At the end of the year, four groups were in training, and beginning in 1944, two groups departed, leaving two B-24 groups - the last of the Liberator groups to be trained at the desert range. All told, there were 21 bomber groups and over 1,000 aircrews that completed training at Wendover airfield, enough to outfit the entire Eighth Air Force, but not all went to that organization. The crews participated in the strategic bombing of Germany, flew in support of D-Day, and conducted combat operations around the world. Three of the groups had Medal of Honor recipients. Bombardment training ended in April 1944 when P-47 fighter aircraft pilot training began and 60 trainees arrived from Louisiana. The 72nd Fighter Wing took charge of the airfield, but only briefly. The program ended in September after three groups, 180 men, had entered training. In 1942 President Franklin D. Roosevelt had established the "Manhattan Engineer District" for the purpose of developing an atomic bomb. 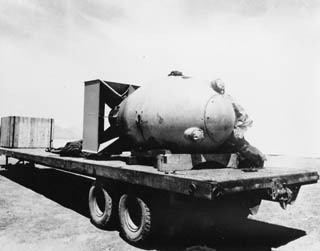 By 1944 development of the bomb was under way and the B-29 bomber was selected to deliver the weapon. General Henry "Hap" Arnold, Commander Army Air Forces and his team chose Wendover Field, Utah as the training site for the 509th Composite Group. They then named Colonel Paul W. Tibbets, Jr. to head the select team. In the 509th, only Tibbets knew the mission of the group and the Wendover site was perfect for this because of its isolation, the ability for security, and the wide open spaces available for training. The hurried departure of the 72nd fighter wing made room for the 393rd Bombardment Squadron (B-29) to be moved to Wendover in September 1944. This move was made without explanation and on short notice, and the 393rd was to become the core of the project to deliver the atomic bomb. The 509th Composite Group was activated on December 17th with a strength of 1,767 officers and men, including the First Technical Detachment, a team of civilian and military scientists. A Special Ordnance Division (SOD) Test Unit, the 216th AAF BU (special) was formed and designated to work on "Project W-47" which was a key part of the Manhattan project. 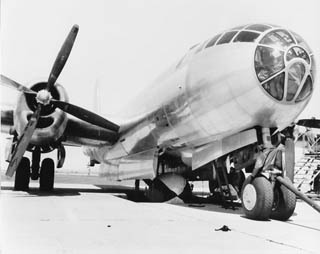 The 216th initially assembled inert bombs or "shapes" which were dropped by B-29s to furnish information on ballistics. Later, the complex fusing mechanisms were incorporated and tested along with detonators, release mechanisms, and modifications to the aircraft. Pits were constructed with hydraulic lifts to hoist the huge bombs into the bomb bay and between late 1944 and August 1945, 155 test units assembled. As the design progressed, Project W-47- personnel assembled more and more complex versions of the "Little Boy" and the "Fat Man" bombs. The "Little Boy" was assembled and tested on Wendover Range. The 216th base unit at Wendover also continued to improve the assembly procedures and techniques on the "Fat Man". In January 1945, a portion of the 393rd group left for Cuba, where they flew simulated combat, high altitude, over water radar bombing and navigation missions. They returned to Wendover and in May received new B-29s which featured lighter engines with fuel injection, reversible electric propellers, pneumatic bomb doors, and a modified tunnel to hold the atomic weapon. A successful test of the "Fat Man," called "Trinity Test," took place on 16 July at Alamogordo Army Air Field, New Mexico. President Harry S. Truman warned the Japanese that a bomb of extraordinary power would be used, but the warning was ignored. Colonel Tibbets took off in the "Enola Gay" at 0245 on the morning of 6 August 1945, and Little Boy was dropped at 0915 over Hiroshima, Japan. Three days later the "Fat Man" was dropped on Nagasaki. 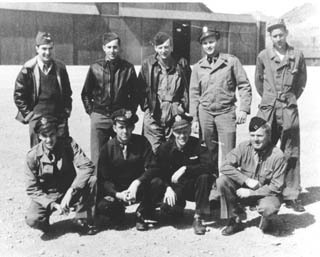 During or shortly after the bombing of Nagasaki, Colonel Paul Tibbetts under orders by General Cutis LeMay, dispatched Lt. Col. Classen, the deputy group commander, in the unnamed victor 94 and crew B-6 in Jabit III, together with their ground crews, to Wendover AAFB to stage for the possibility of transporting further Fat Man [Model 1561] bomb assemblies to Tinian. At Los Alamos, the second plutonium core for the third bomb had been fabricated and was ready for shipment to Tinian by special courier Lt. William A. King on a C-54 cargo aircraft of the 509th CG. These shipments were halted by orders from Washington to hold all shipment of atomic bomb components to Tinian, due to the impending surrender of the Japanese. The 509th departed for Tinian, Marianna Islands, in late May and began flying combat missions, normally one aircraft dropping a "pumpkin" filled with high explosives, but on 20 July an eleven aircraft mission was flown over Japan, each aircraft dropping one bomb. 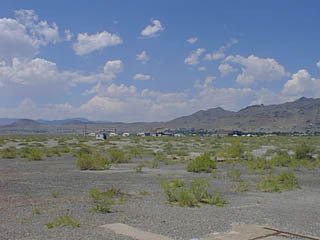 The 216th base unit remained at Wendover, with two B-29 planes and crews and continued producing "pumpkins" and components for the atomic bombs until the end of the war. Immediately after the war, the 216th BU(special) was transferred away from Wendover to an inactive base, Oxnard, just east of Kirtland AFB. This was later designated Sandia Base, and all of the nuclear bomb tooling was moved to this base. Some buildings were disassembled and moved to Sandia, so that by the first of 1946, nothing remained in Wendover of what was a most intense testing, assembly and manufacturing area for the bombs.